Semi-automatic indexing chuck for 4 x 90° indexing. Made with high resistance 60HRC steel UNI18NiCrMo5 to maintain a high degree of precision, reliability and quality. Quick retooling - increasing unit flexibility and productivity. Jaw clamping is automatic through a draw rod and rear cylinder. Slideways jaw execution with gib allows a good sliding surface finish with possibility to recover the clearances from wear. Manual indexing system. Indexing movement is simple and reliable: a conical shutter guarantees the mechanical indexing. Indexing precision ±1′30". 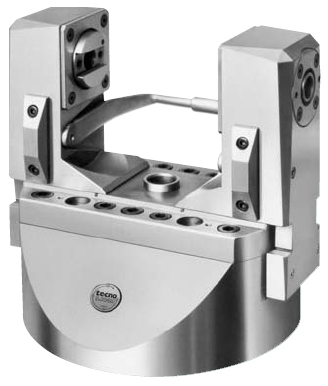 Shaft guide system; pre loaded roller radially and strong axial ball bearing axially. Seals against contamination by coolant, chips and dust. Constant and long lasting precision. Easy installation to the machine.